Note From Will: This is a guest post from reader Alex, a massive thanks goes to him for sharing this method. If you’d like to thank them for this useful post please consider using one of their referral links found here. A lot of people were recently targeted for various Hilton Amex offers but unfortunately, many people reported not having specific offers on their Hilton cards, which is where they would be most valuable. For example, having the $250/$50 Hilton Hotels and Resorts offer on your Aspire card would stack nicely with the $250 statement credit that the card offers itself (on resort stays). You could triple stack this on a trip to Hawaii if you also had the $1000/$200 Hilton in Hawaii. You can see that there are a lot of possibilities with the right offers on the right card. For those with 3rd party Amex cards, most of these are also showing up on the Amex Connect site if you want to enroll your Pathfinder, WF, NFCU card etc. Since I happened to be holding my Wells Fargo World Propel Amex (brought along to assist in my signing up for their Business checking account). Aubergine was able to save me $50. But once I got home, I started wondering if the Amex Connect site would allow me to add these offers to Amex issued cards (my Aspire for instance). Turns out it will. If you get Notification 1, you usually just need to logout and close out of everything and start over with a new incognito window. If you get notification 2, it doesn’t seem possible to add the offer to your account. So, it’s possible you already know this works. But then I noticed some of the Amex Connect offers (they’re all cash back, of course, since they’re meant for non-Amex-issued cards) were offers that were “duplicates” of membership rewards earning offers (for instance the World’s Greatest Cruise Lines $500/$100 offer has a similar $500/10,000MR offer). I was able to successfully add the cash offer to a card that had already had the MR offer added, which should allow me to utilize both Amex offers on a single $500 cruise purchase. Again, you may get one of the notifications above, in which case, you won’t be able to add the offer. Hope this helps some readers. Note from Will: A massive thank you to reader tutoringalext for sharing this post with us. If you’d like to thank them for this useful post please consider using one of their referral links found here. Ditto! Thanks for the tip because it wasn’t showing up on my Brilliant prior. If it is added to a third party amex card, will it be subject to the 1 amex offer across all amex offer channel constraint? You should be able add offers to third party Amex cards without harming your ability to add the offer to an Amex issue card. I don’t have any Amex card, how can I add this offer to Hilton or Amex brilliant. So if I have 5 other third party Amex cards, I can add the same offer to each one? I thought that too. But I think the main concern of AMEX Is offer duplication like the 10% back at Staples which was capped, but obviously the limit could be multiplied by however many AMEX cards were in ones possession to which the offer was added. Clawbacks unlikely with this. another way to game the system (which i love) but just another way amex can claw back. Hey! That worked! I was able to add the Marriott spend $200 get $40 to my Marriott Brilliant card! Good post Doc! Pretty cool idea of trying the Amex Connect on other cards! I’d observe that the offers for their payment network cards are much less plentiful than their own Amex issued cards. So what’s more advantageous? The 250/50 offer shows up on the Amex Platinum BUT must be booked through hilton.com. Doesn’t that take away the 5x points offer that comes from booking through the Amextravel website? Or can one get both?? Hmm, it didn’t work for me somehow. I had added the Marriott and Hilton offers to the non-hotel AmEx Cards (unfortunately, of course, these offers wouldn’t show up on my Marriott/Hilton AmEx Cards). Then I clicked on the “go to your account” link, logged in, and the first thing I saw was the offer, under the specific non-hotel AmEx Card I had linked the offer with. I navigated to my Marriott/Hilton AmEx Card and that offer wasn’t there, so there’s no way for me to even try to link/add the offer to my Marriott/Hilton card. So there’s no way for me to “move/switch” the offer over from my non-hotel AmEx card to my Marriott/Hilton AmEx card(s). Did this both in both regular and Incognito Modes. I saw the 1st notification you mentioned above, but doing it over and over again too (even closing Incognito browser, reopening it, and redoing it), I just kept seeing the notification over and over again and that’s it. No ability to move the offer over to my Marriott/Hilton card. From what you’ve written, it sounds like it’s possible to move the offer over from one card to another via this method and that once it’s done, the offer linked with the previous/initial card would be removed. Anything I did wrong or was there anything I missed? Once you’ve added an offer to an Amex-issued card, you won’t be able to add it to another amex-issued card. Their rule of one offer per social security/name is enforced. 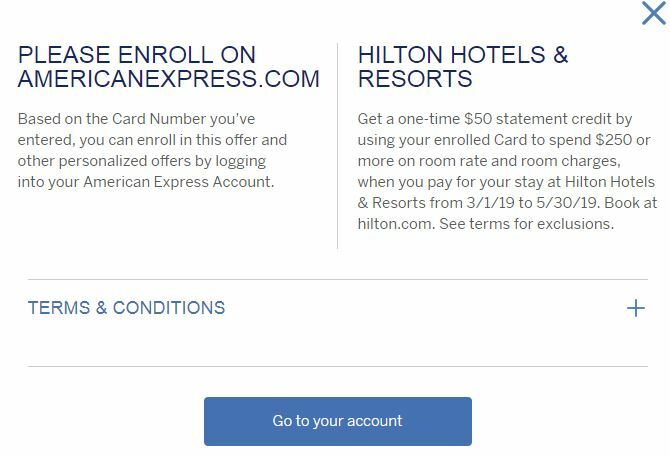 For instance, if you added any of the connect offers to your Amex Platinum, you won’t be able to add them to Marriott or Hilton cards moving forward. Adding the offer to your Penfed Pathfinder or Wells Fargo World Propel Amex cards (or any other non-amex issued card) shouldn’t affect your ability to add the offers to your Amex-issued cards. I think this trick could work for offers that are not yet added to/linked with any of your AmEx-issued card. Unfortunately I had added them to my Everyday Card. Otherwise, it would’ve been possible to move the offers over from my non-hotel AmEx card(s) to the Marriott/Hilton card(s). Lesson learned: don’t add offers unless you’re going to use them. I was trying to add a Ralph Lauren offer to my gold card, but it didn’t let me. When I log in from the connect site it always takes me to my Delta Gold card which has the offer available. I did not add the offer to my Delta gold card. I suspect this trick only works if you don’t have ANY card for which the offer you’re interested in is available. Definitely not the case. As mentioned in the article, I had the Hilton offer on my BCP (and several other cards), and was able to add the offer to my Aspire via Connect. This killed the offer on my other cards though. Now, it may be because all of my cards are on different log ins. Sounds like you’re using the same log in for multiple cards. Yep, I’m in the exact same situation as John Doe. I already added the offer to my everyday card and now can’t add it to my bonvoy card since it’s all the same log in. It is possible to split up the cards up into different log ins when they’re already together? I had the same issue. The offer linked to my Everyday card despite using my Aspire number.